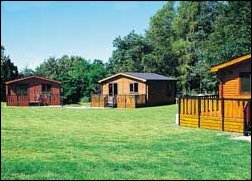 4 Star pine lodges with a choice of 1 bedroom or 2 bedrooms. Set in mature gardens 2 miles from historic Jedburgh. Fully equipped. Balcony and patio furniture. Pets are welcome by prior arrangement. Ideal location for visiting historic castles and abbeys or for fishing on the River Tweed. Ecoluxury guest dwellings for 2-4 guests. 5 stars. 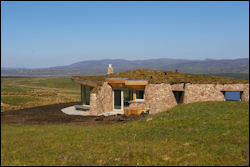 Architect designed, turf-roofed, stone-clad cottages on the Mull of Oa, 4 miles from Port Ellen. Panoramic views. 2 bedrooms (superking and kingsize/twin) each with ensuite bathroom (double ended bath & walk-in shower). Sauna and hand-made cedar hot tub. Wireless broadband. Ideal for romantic breaks, honeymoons, whisky distilleries, birdwatching, walking, cycling, fishing, golf, painting. Holistic Therapies available. Chef and chilled meals service. Shortlisted in the Highlands & Islands Tourism Awards 2015. Secluded cottage provides the perfect setting for a romantic or restorative getaway. Sea views, peaceful surroundings, log fire. Sleeps up to 6 maximum in 3 bedrooms. Comfy living room and garden room, well-equipped kitchen, two bathrooms. Close to beaches, distilleries, nature reserves and Celtic sites. Ideal for birdwatching, walking, cycling, fishing, painting. Traditional croft house at Braes. 5 miles south of Portree. Stunning views of sea and Raasay. Sleeps 2 - 6. Ideal for families. Close to sandy beaches. Fully equipped and refurbished to a very high standard. Polished hard wood flooring throughout. 1 twin room, 1 double room, bathroom, whirlpool bath, kitchen, lounge with sofa bed. Laptop with Broadband. Garden with swing and BBQ equipment. No smoking. Pets welcome. Purpose-built cottage in the crofting community of Braes. 8 miles south of Portree. 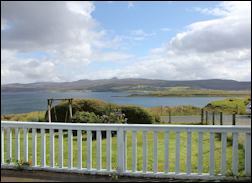 Superb views across to Raasay. 5 minutes walk from sandy beach. Lots of local wildlife. Sleeps up to 5 in 2 spacious bedrooms. TV lounge, fully equipped kitchen, cot, garden, etc. Free WiFi. 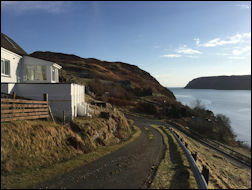 Traditional croft cottage converted to a luxury holiday home in the fishing community of Gravir on the east coast of Lewis. Conservatory and terrace overlooking Loch Odhairn. Magnificent sea and loch views, and great sunsets. Porpoise, otters, eagles are often seen. Stornoway 30 miles / Tarbert 30 miles. Sleeps 2 people in 1 double bedroom, kitchen, lounge, sauna plus shower and bath. Free WiFi. Well behaved small pet welcome. Choice of properties on 30-acre working croft with Highland Cattle and sheep. A short walk from west coast sandy beaches and trout loch. 1 mile from Scarista golf course. 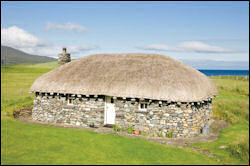 Traditional thatched Black House (5 star quality, sleeps 2/3). 2 adjoining steading cottages (3 star quality, sleeping 5-6). 4 star quality house sleeping 6 in 3 bedrooms, and a 4-bedroom house (sleeps 8). Ideal for families or groups. Free WiFi. Online booking. 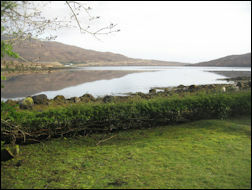 House for 4 people overlooking Loch Seaforth in North Harris. At Scaladale just off the main A859 (Tarbert 11 miles / Stornoway 25 miles). 2 bedrooms (1 double & 1 twin), bathroom, shower room, lounge with wood burner, dining room, kitchen. Internet and office facilities. Off road parking. Short breaks. Pets by arrangement. Newly available to the holiday rental market for 2018. 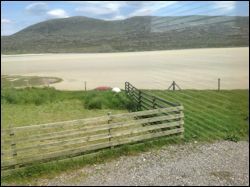 Bungalow overlooking Scarista golf course and the sandy beaches of south Harris. Spectacular sea and mountain views. Leverburgh 3 miles. Rodel 6 miles. Tarbert 18 miles. 3 star quality. 3 bedrooms (1 twin & 2 double), bathroom with shower, lounge, kitchen with cooker, microwave, fridge-freezer, washing machine and dishwasher. Central heating. Small dogs (house trained) welcome. Vacancies from 1 September onwards. Recently renovated 2-bedroom cottage (sleeps 6) with sea views in North Harris. Approx 5 minutes drive from Tarbert along the road towards Scalpay. 1 kingsize double bedroom and 1 bedroom with 1 double & 1 single bed. Sofabed in lounge. 2 bathrooms. Well equipped kitchen, lounge with open fire, small sun room. Decked area and fenced garden with picnic table. Pets welcome by arrangement. Availability in February, March, April and October 2019. 4 star luxury self catering house at Leverburgh overlooking sea loch. Sleeps 6-7 people. Ideal for families. 3 bedrooms (1 super king, 1 king double, 1 with 3 single beds), 2 bathrooms (one with Jacuzzi®, one with shower). Free WiFi. 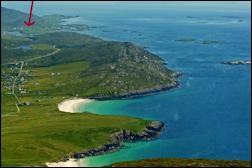 Close to South Harris sandy beaches. Fishing, golf, bike hire, kayaking. Short breaks off-season (November - March). One dog welcome (small charge). Set right by Seilebost beach in South Harris overlooking Luskentyre with open sea views across to Taransay & the North Harris hills. Ideal for families. Pets welcome. 15 minutes drive from Tarbert and Leverburgh ferry piers. Traditional croft cottage refurbished to a high standard (sleeps 7) in 4 bedrooms: 2 double, 1 twin & 1 single, modern oak kitchen, open fire in the lounge. Well-equipped 35�x12� luxury caravan (sleeps 6) in 3 bedrooms (1 double, 2 twin), Sky TV, open plan kitchen/diner, full size shower cubicle, fenced garden. 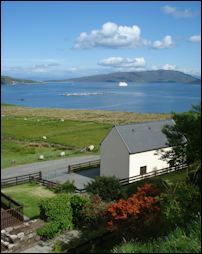 House in West Tarbert (sleeps 4 in 1 double & 1 twin bedroom). 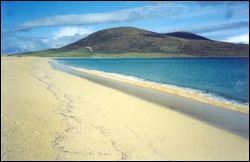 10 minutes walk from the ferry terminal (isle of Harris). 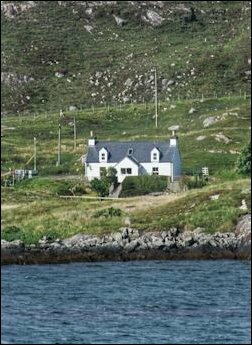 Glen Carragrich (sleeps up to 4 in 3 bedrooms). Traditional cottage situated 3 miles from Tarbert (Harris) on the Scalpay road. Wonderful views of East Loch Tarbert. Beautiful log house with panoramic views of Ben Nevis just 3 miles from Fort William. 6 bedrooms, sleeps 10 people. Scottish Tourist Board 4 Stars. Virtual tour online. Spacious lounge with wood burning stove, TV, VCR, DVD, dining room, kitchen with dishwasher, washing machine, tumble drier, water purification unit. Free WiFi. Availability for March, May June and September 2019. 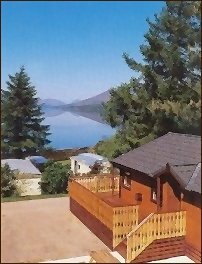 5 miles from Fort William this award-winning holiday park is graded 4 stars by the Scottish Tourist Board. Beautifully landscaped with private beach and many on-site amenities. Alpine-style pine chalets with 2 or 3 bedrooms (sleeping 4 - 5 - 6). Scottish Tourist Board 3 and 4 Stars. Each chalet has a fully equipped kitchen, lounge with TV/DVD. patio doors, balcony & picnic table, central heating, double glazing. Some of the chalets are pet friendly. Shop, launderette, adventure playgrounds, pet exercise areas, drying room for sports equipment, toddlers' play room, baby bath, dish washing room, tourist info, WiFi hotspot. Heated amenities with private cubicles and baths. Free fishing & boat launching available from the park's private beach. 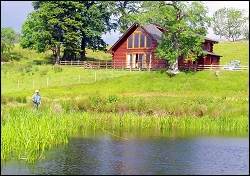 Choice of accommodation on 500-acre organic farm with sheep and Highland cattle. Late availability this summer. Short breaks off-season. 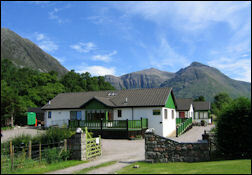 Choice of 4 star properties in Glencoe. Magnificent mountain views. 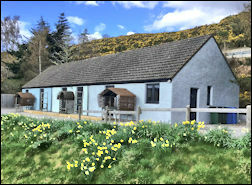 Lodges and Chalets (2 or 3 bedrooms, sleeping 4 - 5) in the grounds of the Clachaig Inn. 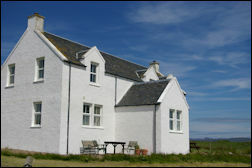 Cottages (2 or 3 bedrooms, sleeping 4 - 6) on the banks of the River Coe. Cottage (3 bedrooms, sleeping 6) on the shores of Loch Leven. Also 2 cottages sleeping 7 and 10. All properties have central heating, lounge, fully equipped kitchen. Excellent base for outdoor activities such as hillwalking, climbing, sailing, skiing, snowboarding and mountain biking. 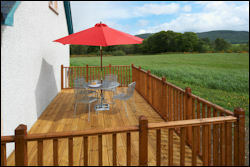 Choice of 3 cottages (sleeping 2 - 4 in 1 - 3 bedrooms) set on the banks of the River Nairn with spectacular mountain views. Wi-Fi access. Only 20 minutes from the unspoilt south side of Loch Ness & 20 minutes from Inverness. Availability for spring and summer 2019. High quality self catering for 2 people on a small farm. 10 minutes drive from the centre of Inverness. Self contained apartment with views over farmland and hills. 1 kingsize double bedroom, shower room. Living area/kitchen with 32 inch TV, DVD player, microwave, 4 ring hob with oven, fridge, freezer, dishwasher, washer-dryer, etc. Free Wi-Fi. Decking area with furniture. Safe off-road parking. Availability this winter. Instant online booking. Set on the River Findhorn between Inverness and Aviemore. A traditional cottage with 2 twin bedrooms, 2 bathrooms, kitchen, lounge with woodburner. Ideal base for outdoor activities or touring. Fishing for wild salmon and brown trout can be arranged, as well as rough shooting with a ghillie. Skiing, walking, wildlife, watersports, etc. all available locally. Instant online booking. Stone-built cottage with mountain views on Upper Loch Torridon in the hamlet of Annat, next to Torridon village (Wester Ross). Sleeps 2 people. Recently refurbished with 1 double bedroom, bathroom with bath, electric shower, wash basin and toilet. Living room with log burner (sofa bed for 2). Well equipped kitchen, electric hob, oven, fridge freezer, washing machine. Fully enclosed garden with BBQ. Free WiFi. Pets welcome by arrangement. 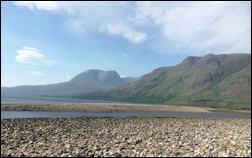 Stunning views across the loch to Beinn Alligin and Liathach. Ideal for boat trips, beaches, mountain biking, hill walking, etc.